With very few exceptions everyone applying for an Employer Sponsored or Skilled Migration Visa is required by the Australian Government to sit for the IELTS Test or, in the case of Health Practitioners, the Occupational English Test (OET). No other evidence of your English language ability is acceptable as part of your Skills Assessment or Visa Application. 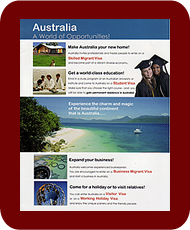 Nearly everyone who wants to come to Australia under the Employer Sponsored and General Skilled Migration Program is required to present formal evidence that they have achieved a certain level of English by showing that they have gained at least a certain minimum score in the IELTS Test. This means, in effect, that just about everyone who wants to migrate to Australia has to sit for the IELTS. We have therefore added this new section to our web site - to give you detailed and comprehensive information about the IELTS Test. The International English Language Testing System (IELTS) was originally designed to assess the English Language ability of people wanting to undertake higher education studies in countries where English was the language of communication and instruction (similar to the American TOEFL Test). In a relatively short time it became widely accepted by universities in many countries, including Australia, Canada, New Zealand, the UK and the USA, as an excellent indicator of people's readiness for university studies in English and soon it was accepted also by immigration authorities, government agencies and professional bodies as a good indicator of people's ability to cope with work and employment in an English speaking environment. What's special about the IELTS is that it determines how well you are able to actually USE English - how well you can understand spoken English, how well you can comprehend written English and how well you can express yourself in written and spoken English. In other words, it does not test how much you know about English grammar. Do you have to sit for the IELTS Test? Unless you have a passport from the UK, Ireland, Canada, New Zealand or the US, you have to do the IELTS Test. And even if you do have such a passport, you still have to take the test if you want to claim points on the Points Test - to claim 10 points you need a score of 7 and to claim 20 points a score of 8 in all 4 components of the IELTS. (If you are a Health Professional you may have the option of taking the Occupational English Test (OET) and gain 10 points for a B score and 20 points for an A score - ask your Migration Agent for advice).